Dr. Azarbal offers patients two options for teeth whitening: custom take-home trays with a bleaching gel or the in-office gel and light-activated whitening treatment known as ZOOM!® Whitening. Don’t want the hassle of using home whitening gels and waiting a couple of weeks for results? ZOOM!® Whitening system from our cosmetic dentist, Dr. Arash Azarbal, can be done in about an hour and produces dramatically whiter teeth. Retractors are placed to hold the patient’s lips away from the gums. A napkin is placed over the lips and a soft coating is put over the gums to protect them from the bleaching gel. The hydrogen peroxide bleaching gel is applied and the LED light is directed at the patient’s teeth. The patient will remain under the light for 15 to 60 minutes, depending on how quickly the teeth respond to the treatment. The most affordable option, this treatment involves using a take-home bleaching gel with a set of trays that are custom-designed to fit your teeth. You can wear the trays at night or during the day and your teeth will gradually become whiter over the next few days and weeks. Once you reach your desired level of brightness, you stop wearing the trays. You may keep the trays and gel for periodic touch-ups. 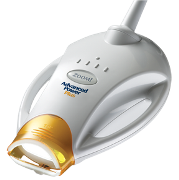 The ZOOM!® Whitening system offers faster results without the need for take-home trays and gel. It is slightly more expensive, but only takes one visit and can usually be performed in less than an hour. With this system, Dr. Azarbal uses a special bleaching gel with a LED light to quickly activate the teeth whitening properties of the peroxide gel. The bleaching gels used by cosmetic dentists like Dr. Azarbal are much stronger than the gel systems you can buy over-the-counter. If used very consistently over a long period of time, the over-the-counter products can whiten your teeth. However, you are more likely to spend more money on these products and get poorer results because they aren’t as effective. Whitening toothpastes will not have the same effect as peroxide bleaching gels because they only remove surface stains from tooth enamel. Most noticeable stains are ones that have penetrated and stained the dentin (the interior layer of the tooth). To achieve effective teeth whitening, you need a product that will stay on the teeth long enough to penetrate the enamel and reach the dentin. 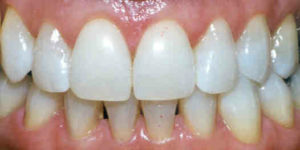 A patient’s teeth before using a supervised teeth-whitening system. Before take-home treatment. The same patient after using a supervised home teeth-whitening gel. The same patient’s teeth after. How long your teeth remain white depends on several lifestyle factors. If you avoid foods that cause dark teeth stains (coffee, wine, berries) and other practices, like smoking and other tobacco use, your teeth can be kept white for a long period of time. Over time, however, everyone’s teeth will get darker and require subsequent touch-ups to regain their white appearance. To help you decide which approach is best for your desired outcome, our experienced dentist has answered some of the most common questions about teeth whitening. If you have additional inquiries, or if you would like to schedule a consultation with Dr. Azarbal, please reach out to our team. Both in-office and at-home approaches offer many benefits. Many patients choose to combine the two for more dramatic teeth whitening. Others may opt for one or the other. If you would like faster results, the in-office treatment can provide a beautiful effect in just 60 minutes or less. Some individuals prefer to whiten in the comfort of their home or would like a more affordable option, in which case at-home whitening may be recommended. Also, patients who have sensitive teeth might find the in-home bleaching more comfortable as it is more gradual, and patients can reduce frequency of use if they start experiencing sensitivity. We can discuss all your options during your initial consultation and find the ideal technique for you. For the professional in-office procedure, results can be seen immediately after the treatment. Many patients notice that their teeth continue to get brighter for a day or two after as well. At-home whitening can take longer, and you should begin to see some lightening after about a few days or a week, depending on the level and type of staining. Very deep stains, or those caused by certain medications, may require a different form of teeth whitening, and Dr. Azarbal will discuss this possibility with you at your first meeting. Will the treatment cause sensitivity? Some patients do experience sensitivity from teeth whitening. We do everything we can to limit irritation and discomfort during the in-office procedure, and at-home treatment may be more comfortable for some people. Patients with existing sensitive teeth can also use fluoride in their bleaching trays for a couple of weeks prior to the treatment to reduce sensitivity. You may wish to take an over-the-counter pain reliever during the whitening process to help minimize sensitivity. We can suggest other options if desired during your appointment. How often will I need to repeat the process? Everyone’s teeth become darker over time, which means that no whitening process is permanent. That said, you can maintain your results easily with occasional touch-up treatments. Many patients receive a whitening procedure, either at home or at the office, every six months or so. If you use tobacco products, drink a lot of coffee, tea, or red wine, or have other lifestyle factors that cause staining, more frequent whitening may be required to preserve your desired outcome. How can I make the results last longer? Excellent oral care is one of the best ways to maintain beautiful, white teeth. Other factors include abstaining from stain-forming habits, like smoking, chewing tobacco, and drinking coffee, tea, red wine, soda, and other staining beverages. Certain medications may cause teeth staining, and Dr. Azarbal can provide a list if needed.